Tesla unveiled a new product line at its design studio in LA tonight. 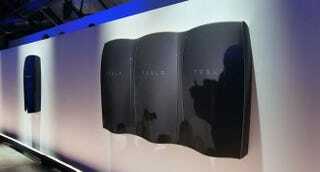 It’s called Tesla Energy and it’s a suite of batteries for homes and for businesses. The existence of the batteries has been one of the worst kept secrets of all time. But we are here at the announcement event and finally have some details. And they’re pretty damn cool. It does sound crazy. But that’s the business Musk seems to have gotten himself into. The home battery is called the Powerwall. The business-targeted battery is called the Powerpack. They’re “completely sustainable, zero carbon,” as Musk puts it. The Powerwall increases the capacity for a house with solar panels, but can also be used during power outages. It can fit on the wall in your garage—to power your Tesla, of course—or the outside wall of your house. It’s about 3 feet across, 4 ft tall, and 6 inches deep. It comes with a 10 year warranty. It’s connected to the internet so it’s constantly talking to Tesla Energy and monitoring usage. Tesla’s selling price to installers is $3500 for 10kWh and $3000 for 7kWh. Business battery prices haven’t been made public as of yet. You can order the Tesla Powerwall battery now online but they’re not slated for release until late summer. The Powerpack (business version) will start to become available later this year. They’ll be making a larger push with businesses in 2016. But that being said, they’re already out in the real world. The company partnered with SolarCity for a pilot project in California that supplied roughly 300 homes with the batteries. About a dozen Walmart stores in California and a Cargill animal processing plant have the business-grade batteries and have been testing those as well. Tesla Energy plans to be in Germany and Australia by the end of the year. He also sees potential uses in developing countries with little access to reliable power. “In a lot of places there are no utility lines,” Musk said. Is Musk using them at his home? Yes, but he’s not going to be able to go completely off the grid soon. By pulling homes and businesses off the grid during peak hours, America’s electrical infrastructure would see greater stability. With enough people on board (and critical mass of adoption is obviously a ways into the future) we’d likely see fewer brownouts in our cities. Another attractive part for consumers is that this kind of battery will give homeowners complete energy independence, allowing them to sever connections to utility companies. What are the specs for the home version? Well, that depends on a lot of things. Do you have a home? Do you live in an area with a lot of sunlight? Do you have a bunch of extra cash to make an investment in clean energy? Then yes, you should definitely look into the Tesla Energy line of products.